During our road trip from Manchester Vermont to Toronto, we were in no rush. Along the way, we were actively looking for amazing places to explore. We were lucky to be driving near the scenic town of Howes Caves, New York and decided to stop and see what gave the region such a unique name. We ended up exploring two incredible caves in upstate New York. The fun and exciting Secret Caverns and the town’s namesake, Howe Caverns New York. Where is Howe Caverns NY? Howes Caverns New York is about 45 minutes east of the city of Albany New York and about 2 hours west of Syracuse. Howes Caves, where Howe Caverns is located, is a small hamlet situated near Cobleskill. The picturesque farms and sleepy lifestyle give little evidence to the excitement that lies below the surface of this quiet town. Howe Caverns was discovered in 1842 by local farmer Lester Howe. He noticed that the cows in his field would frequently gather on hot days in the same spot and went to investigate. When Lester Howe arrived at the spot, he felt a cool breeze coming from the ground and decided to explore further. What he discovered was a 6-million-year-old cavern in the limestone earth. After some adventurous exploring, Howe opened the caves up to visitors the next year. Howes Caverns has become one of, if not the most popular caves in New York State. In fact, it has gone on to become the second most visited natural attraction in New York, second only to the famous Niagara Falls. 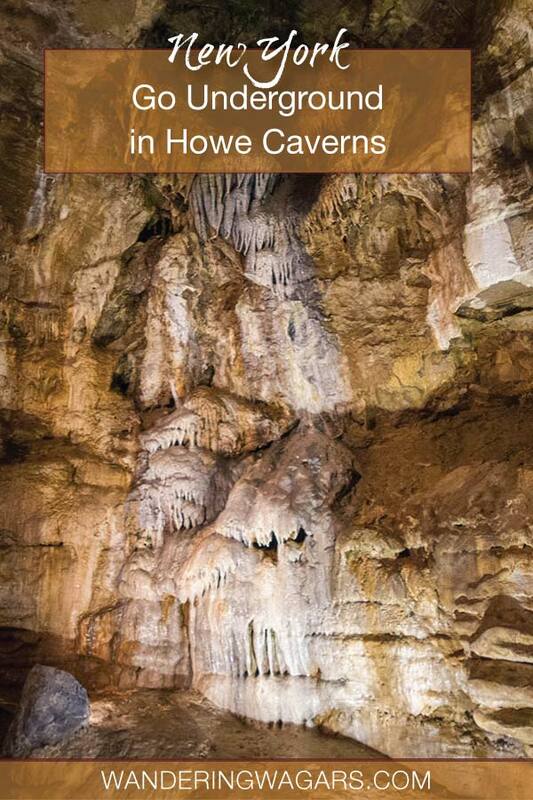 The popularity of Howes Caverns has been helped by their continual development of attractions. The accessibility, features, and fame have led Howe Caverns to become one of the most popular caves in upstate New York. It is definitely the most visited cave in New York. While the main feature of Howes Caverns is the incredible cave system, the location has developed into near-amusement park levels. Howes Caverns attractions include zip lines, a rope course, rock wall climbing, and the H20Go ball (a giant inflatable ball that you climb inside). Combine these fun family-friendly activities with picnics and the cave system, and there is no lack of things to do at Howes Caverns. There are a number of different Howes Caverns tours to experience as well. They offer a rock discovery tour, spelunking tours, and even overnight experiences for those looking to add a little adventure to their Howes Cave exploration. The Howes Cavern cave system lives up to its popularity. This immense system has been featured by major nature programs including National Geographic. And with nearly 200 years of human history behind it, it’s no surprise why. 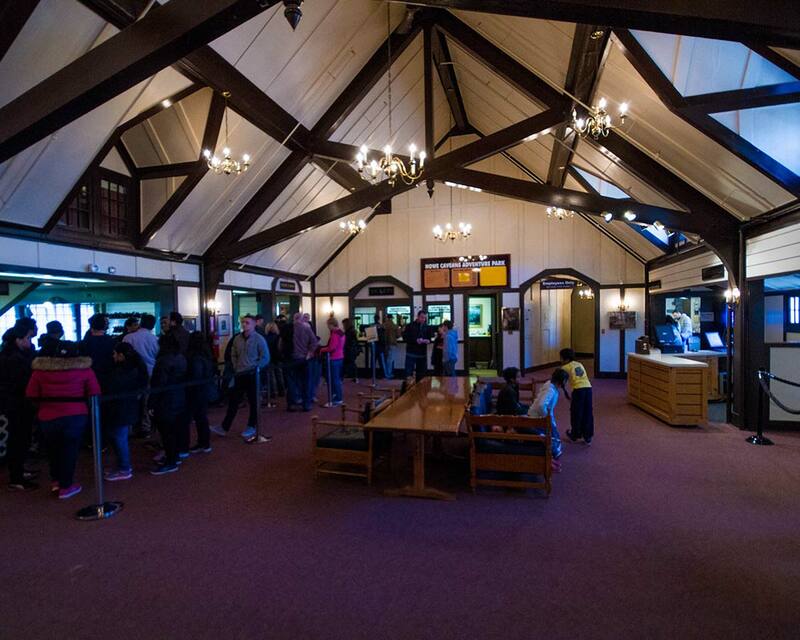 Tours of Howe Caverns New York begin in the main building. This is where the on-site cafeteria is as well. Lines can be long and entrances are timed. If you are able to book your tickets in advance you’ll save yourself a lot of waiting. Entrance to Howes Caverns is via an elevator that descends 48 meters (156 feet) down into the earth. From there, visitors are guided through the multiple levels of well lit rooms. While not as extensive as some of the caves we visited in El Nido, Philippines, there is no doubt that Howes Caverns is far more developed. 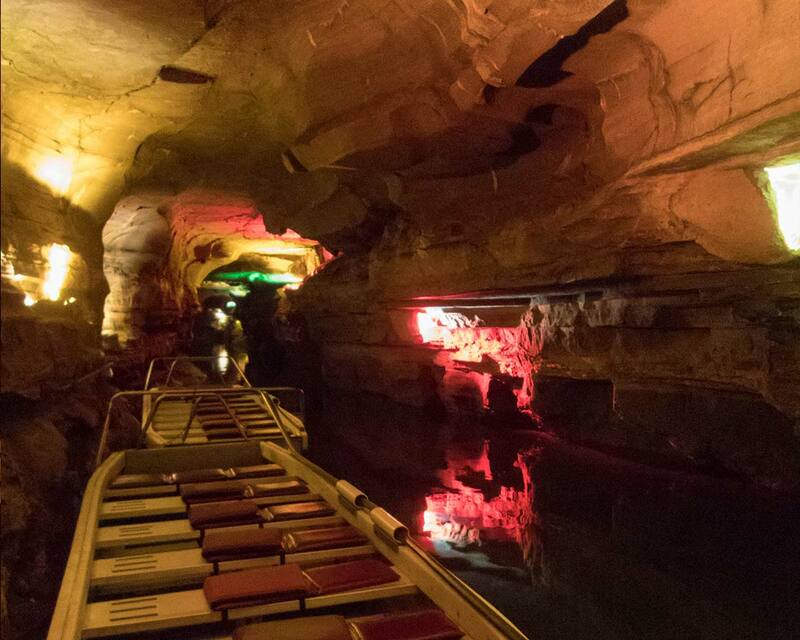 The Howes Cavern tour includes a boat ride through some of the water filled rooms of the cave system. The cave water is crystal clear and offers beautiful views of the rock formations at the bottom. The flat bottom boats sit three astride and about 12 people per boat plus the guide. One of the rooms in Howes Cavern is a popular spot for weddings. 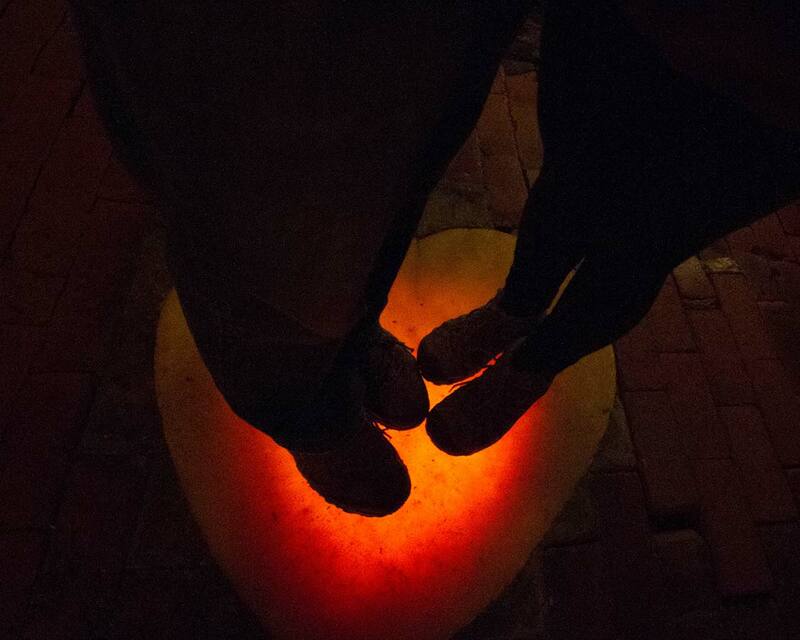 In fact, the cave staff has even placed a lit stone heart on the floor of the cave that makes for the perfect romantic ambiance for a cave wedding. Howes Caverns is built as a family-friendly destination, so Howes Caverns with kids is a perfect family getaway. The proximity of the cave near Albany NY also means that lots of families make the trip. Howes Caverns is one of the easiest caves for kids that we’ve visited. The level ground and easy maneuvering make a visit fun and stress-free. The hardest part is the line waiting to get in. Some of the attractions, such as the zip line and ropes course have a weight limitation that means children younger than 5 or 6 years old may not be able to take part in some of the Howes Caverns attractions. But there are more than enough things to do to keep the whole family occupied even if you can’t do it all. It’s very easy to combine a visit to Howes Caverns with a visit to nearby Secret Caverns as well. There you can visit the underground waterfall and have a very different, less commercialized experience. When to Visit Howe Caverns New York? 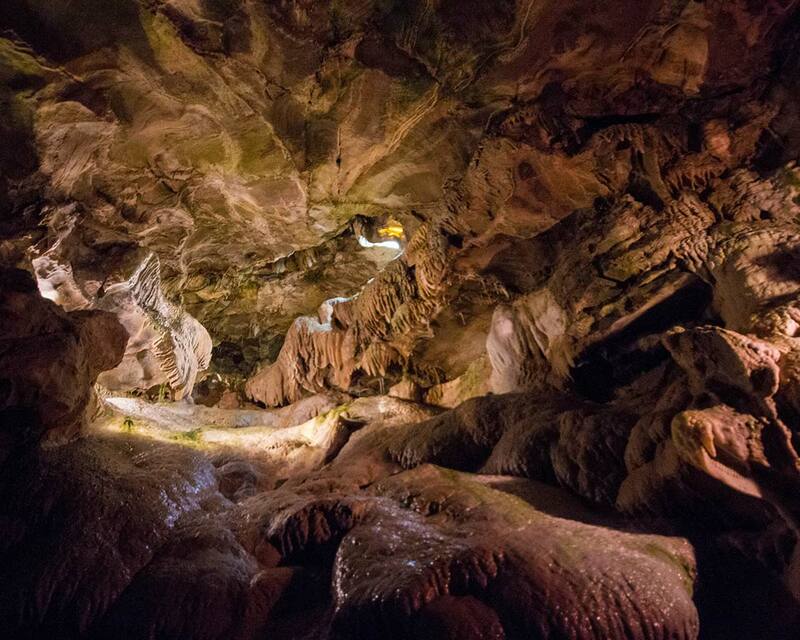 The Howe Caverns New York cave system is a seasonal destination. However, not all of the outdoor attractions are open at the same time. 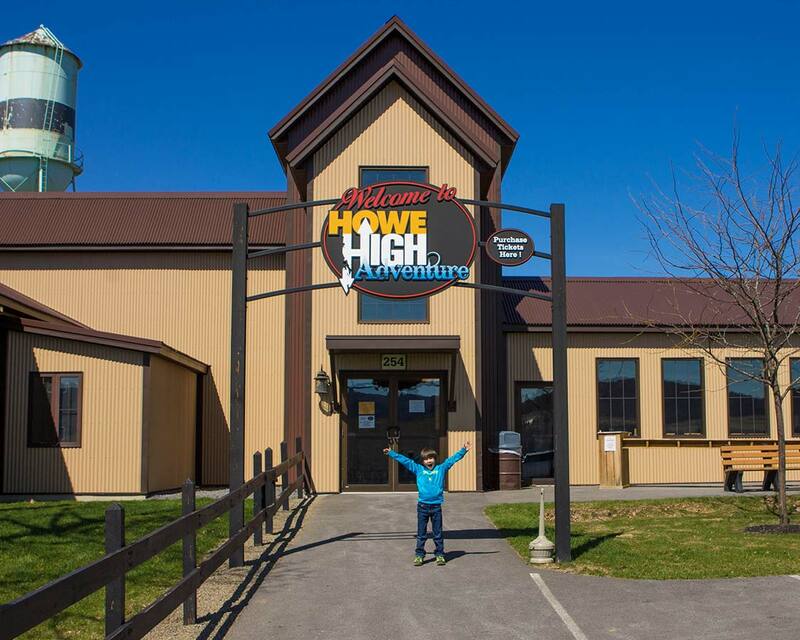 In the early season the cave opens on weekends, however, the Howe Caverns adventure park opens later. It’s best to call ahead if you are in the shoulder season to see if the Howe Caves attractions have opened for the year. Howes Caves New York is a pretty remote area. The two main attraction of the regions is Howe Caverns and Secret Caverns. But, there are still a few other family-friendly attractions in the area such as the Iroquois Indian Museum and the Old Stone Fort in Schoharie for a little more regional history. 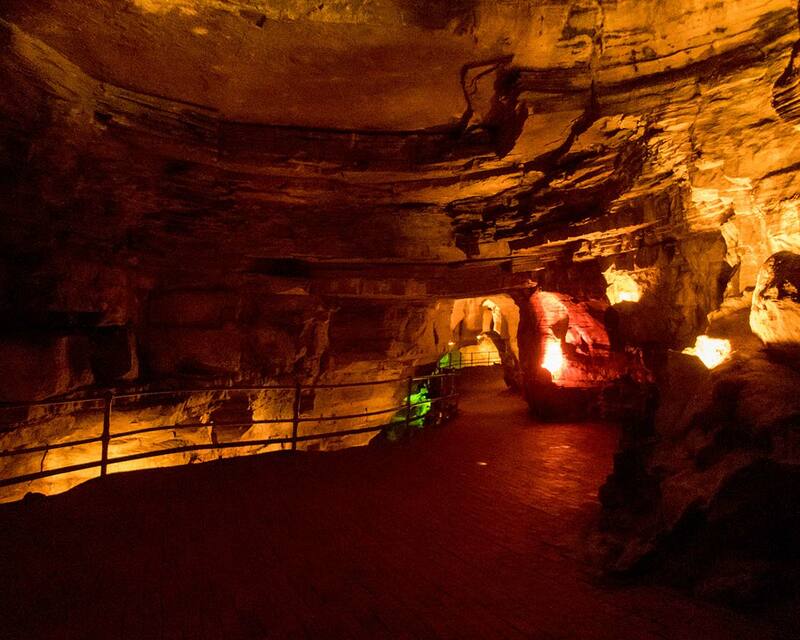 Do We Recommend Visiting Howes Caverns New York? 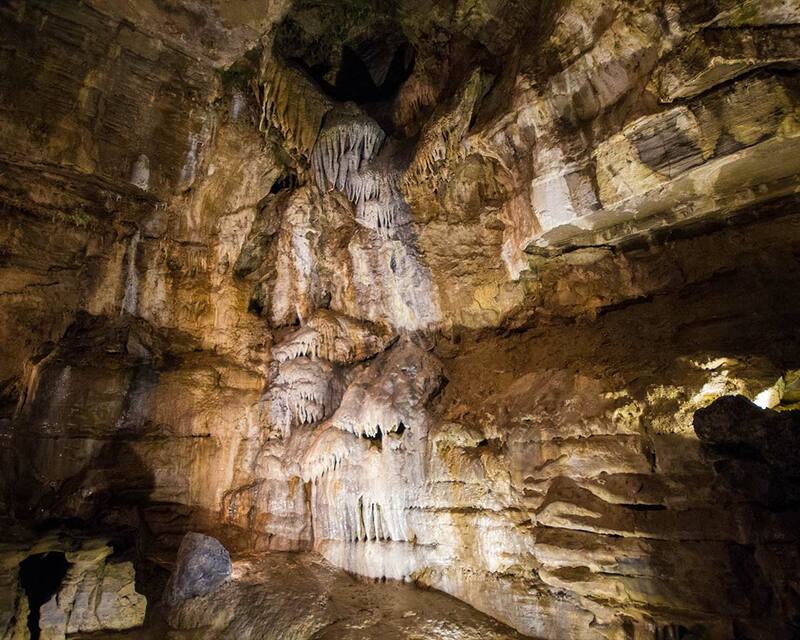 Howes Caverns is caving at it’s most commercial. This popular show cave is well-lit, easy to explore for nearly all ability levels, and by all rights, a fun and exciting experience for the whole family. Unless you join one of the Howes Cavern adventure packages, visitors aren’t going to find themselves squeezing through narrow passages or discovering new rooms by headlamp. But you can be guaranteed some entertainment and great stories told by the experienced tour guides. A visit to this cave system is definitely worth the detour. What Are The Best Hotels Near Howe Caverns? While you can opt for staying at the Howe Caverns Motel, there are also several decent hotels near Howe Caverns that are worth looking into. While you won’t find any high-end resorts in Howe Caverns, there are some decent hotels near Howe Caverns. The Super 8 in nearby Cobbleskill is less than 4 miles away. The hotel comes with free wifi and free breakfast. There’s also a game room with a pool table for a little extra fun. If you don’t mind traveling a little further, the Quality Inn & Suites in Schoharie, about 9 miles from Howe Caverns is a pet-friendly hotel. Although the breakfast isn’t included, there is free wifi available. While staying in a hotel near Howe Caverns is great, after all that adventure you may be looking to do some camping near Howe Caverns. John Boyd Thatcher State Park is about a 40-minute drive from Howe Cavern and gets excellent reviews. 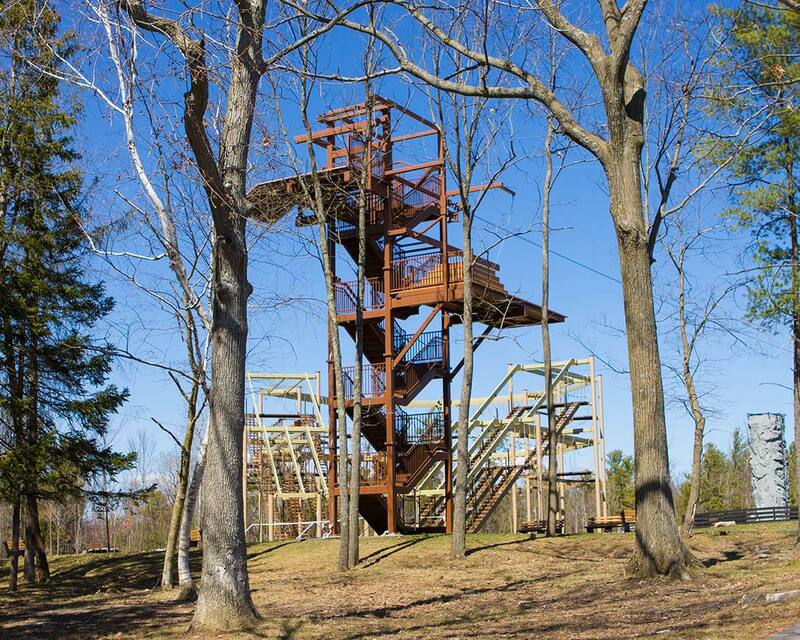 It has excellent views of the Hudson Valley and some nice, family-friendly hiking trails. Amazing how it is number 2 after Niagara Falls and I never heard of it Kevin. Especially considering the fact that I grew up in New Jersey LOL! The thing I learn more and more about Upstate New York; the place is like its own country. Not its own state, separate from NYC. But its own nation. From the incredibly diverse range of things to do and sights to see to the impressive area of the upstate region, NY is a gem to behold. Like its own world up there. Thanks for the fascinating share buddy. It’s a cool place. You’ll be there a couple of hours. The caverns are fun. If you’re allergic to mold or mildew then take Benedryl before you go down and maybe after too. The little boat ride is the best part. The cheese that is aged in the caves is on sale. It’s VERY sharp but good.It’s a nice little walk and tour. Great tips Addy. We weren’t dealing with allergies (luckily!) Benadryl is a great idea. What an amazing experience. It’s such a wonderful place.